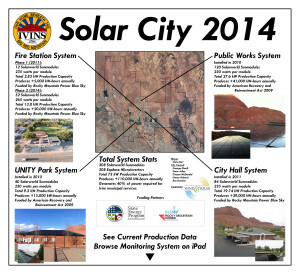 Ivins City has taken steps towards going “Solar.” We have recently installed solar panels at four City locations: City Hall, Public Works, Fire Station and UNITY Park. To view the monitoring systems for these locations, click on the appropriate links below. Public Works Monitoring System HERE . The Blue Sky Community Challenge is a program managed by Rocky Mountain Power promoting community support for renewable energy projects like ours. For us to qualify Ivins City must be a Blue Sky participant along with a percentage of our residents. Several of you already are, and thanks to your generosity the City is now on board using your donations rather than public monies to fund our obligation. We asked for your help and many of you responded making our participation possible. Thank you for that. The City has only reached an entry level threshold however, and we still need several additional residents to sign up in order to achieve the Blue Sky Community designation. I urge all of you who support the concept to enroll in the program directly through Rocky Mountain Power or by contacting Kai Reed at kaiallenreed@gmail.com or by calling 674-5376 for help. The monthly contribution is nominal and can be paid with your power bill. The City asks only an additional $10.00 per year to fund its share. That ten dollar donation can be sent to Ivins City with the specific designation that it is to be used for the Blue Sky program. Furthermore we’d like to create a registry of local participants so we know who to thank. Please provide Kai Reed with your name and contact information. Due to the Privacy Act we cannot obtain that information through Rocky Mountain Power. We’re almost there. In an upcoming Rocky Mountain Power bill you will receive a letter and detailed information on the Blue Sky Community Challenge and the Blue Sky Program. If you find it worthwhile and are in a position to participate please respond to the invitation to become involved. Our first Blue Sky grant came without our being a Blue Sky Community, but as of this year that will not happen again. Only Blue Sky Communities are now eligible for renewable energy grants through the Blue Sky program and when we achieve that designation we will be one of only nine communities in the State of Utah. 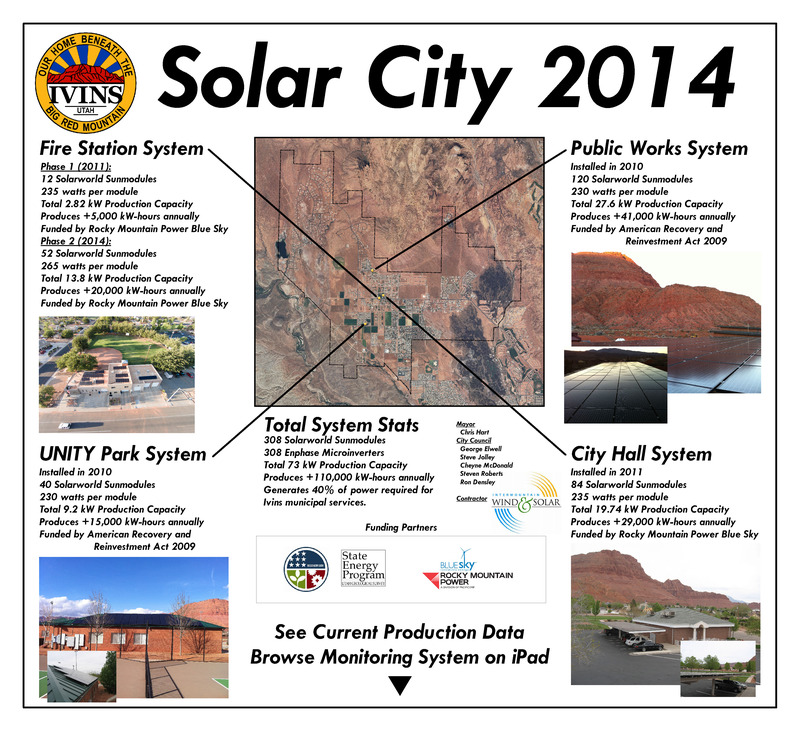 That opens the door for future solar development within Ivins City. As a side benefit, Blue Sky Community status will enhance our image with executives considering Ivins as a place to potentially expand or locate their technical or research related businesses.